Charter a private jet from Los Angeles to Las Vegas with our on-demand charter plane rentals! Jet Charter Vegas offers around the clock air charter services between the City of Angles and Sin City, home to two of the largest private aviation markets in the world. Whether you’re flying to Vegas for business or pleasure, we’ll connect you to the perfect charter plane in LA. Our aircraft rentals are available 24 hours a day and we cover all of Southern California, finding you the best plane at the best price for every flight. Call us at 888-987-JETS or email us for a free quote, and book your private flight from Los Angeles to Las Vegas with Jet Charter Vegas. Charter a private flight from Los Angeles to Las Vegas and gain access to thousands of charter planes based in LA and across Southern California. This includes empty leg jets (also known as deadhead flights) returning to Vegas, which offer substantial savings. Enjoy free quotes without any commitment, contracts, charges, or member fees — pay as you fly and we’ll find the best deal every time you request a flight. Do you frequently fly private? Aside from locating the best planes for on-demand charter flights, we offer 25, 50, and 100 hour jet card memberships, with guaranteed rates & availability on a wide range of aircraft types. Most private flights from LA depart using Van Nuys Airport (KVNY). The private jet hub of Hollywood, the route between Van Nuys and McCarran Airport is the busiest private jet route in the United States. Santa Ana-John Wayne Airport is the second most popular departure airport in LA for Vegas bound flights, and it’s home also to several private planes. Other popular airports include Burbank-Bob Hope, Long Beach, Santa Monica, Palm Springs, and Santa Barbara. Check out some example prices for private flights from LA to Vegas. For charter costs and aircraft availability, including estimated cost and all-inclusive charter quotes, our brokers are available around the clock, including last minute trips and ASAP flights. Light and super light jets are perfect for short flights from LA to Vegas, flying at high speeds with seating for up to 7 passengers. Popular light jets for flights for this route include Hawker 400XPs, LearJet 40/45s and 70/75s, the Citation CJ series, and the world’s best selling business jet, the Embraer Phenom 300. Light jets offer a range of approximately 1,500 nautical miles while flying at speeds of up to 500 mph, getting you from LA to the Strip in just over an hour. Heavy jets offer comfort, capacity, and amenities that smaller planes can’t compete with. While built to excel in cross country flights, many heavy jets offer excellent short range performance and available for charter through many operators, especially along the most popular private jet route in the US. Popular aircraft choices include Challenger 600’s and 800’s, Falcon 900’s, and the iconic Gulfstream G4 luxury plane. Rent a heavy jet from Van Nuys to McCarran Airport, and you can arrive in less an hour, with room for up to 12-14 passengers. 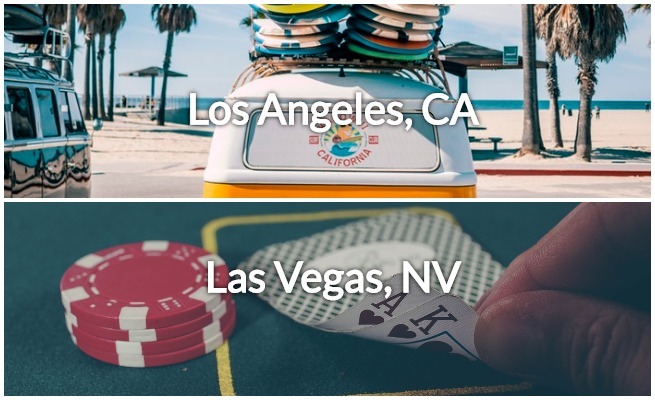 * Examples pricing based on previous flights between LA and Vegas. Prices are all-inclusive plus tax. Additional services (de-icing, catering, additional flight time due to weather or ATC, internet charges and/or ground transportation) billed separately. Prices and availability are subject to change. Pricing based on Van Nuys to McCarron Airport. Additional CA and NV airports available. Request a free quote or give us a call at 1-888-987-5387 to book a private charter plane from Los Angeles, CA to Las Vegas, NV.